The Purple Velvet plant is an incredibly unusual houseplant, which features green leaves covered in tiny, purple hairs. From a distance, the hairs are so dense that they give the impression of the leaves having a soft velvety texture, in a vibrant purple color. These plants have long been popular, not just because of their striking appearance, but also because they are fairly easy to care for, getting along well in the average temperatures of most homes. The most difficult part of looking after a Purple Velvet plant is getting the watering just right, as the plant enjoys moist soil but has delicate roots which can easily be affected by root rot. If you have some experience with caring for houseplants and are good at recognizing when a plant does or doesn’t need more water, then this may be the ideal plant for you. This plant does have two drawbacks, though fortunately, both of them are easily dealt with. First, the plant can develop flowers, and although they are not unattractive, they do have a very bad odor that many people find unbearable (University of Florida). The solution to this is to snip off the buds as soon as they appear, not giving them a chance to flower and become stinky. The other benefit of this is that the plant's energy will go into continued production of the beautiful leaves instead of wasting it on average looking flowers. The second drawback is the fact that the plant has a short lifespan of just a few years. When the Purple Velvet plant reaches maturity, it loses its vibrancy, and the leaves will look more green and dull. To combat this, you will need to propagate your plant every few years to ensure you have a continued supply of the plant’s next generation to decorate your home with. The roots of the Purple Velvet plant are particularly fragile, making them even more susceptible to root rot than your average houseplant. Because of this, it's especially important to make sure you don't overwater this plant, as having wet feet will likely destroy the plant. Your best defense against root rot is a high quality, well-draining soil and paying close attention to the moisture level of the soil. While the plant should not be allowed to sit in water or soggy soil, it will also react badly to drought. If the plant isn't getting enough water, then you will notice the leaves starting to droop and become quite sad looking. You will need to develop a balanced watering method, where the plant receives just the right amount of water. Exactly how often and how much you should water the plant will be largely dependent on the size of the plant and how much sun and warmth it is getting. Aim to keep the soil moist but not wet during spring and summer, while for the remainder of the year, you can allow the soil to dry out a little between each watering. 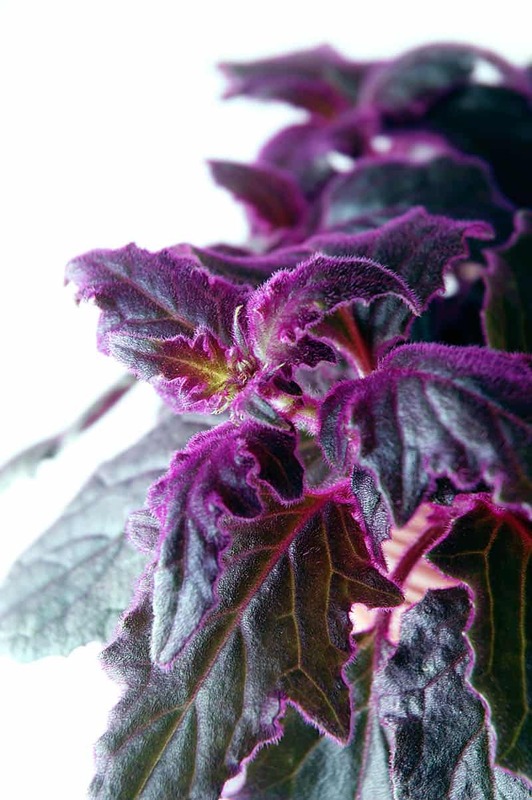 The Purple Velvet plant enjoys bright, indirect light. It will happily sit in a bright window, though direct light will cause the leaves to burn, so use sheer curtains or window blinds to filter the light. 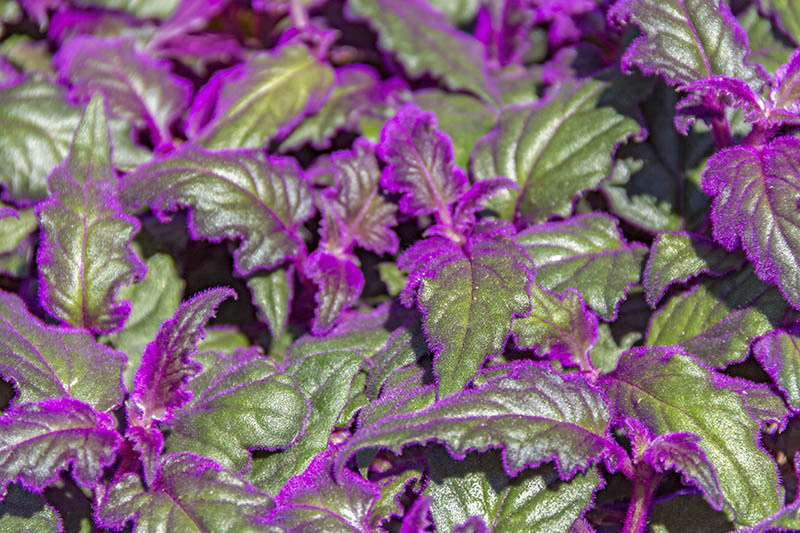 If this plant lives in a shaded area and doesn’t receive enough light, the hairs on the leaves will dull, and it will lose the vibrant purple coloring that it is grown for. A light-deprived Purple Velvet plant will also become leggy as it stretches to find a light source. If you don’t have an appropriately light spot in your home to suit this plant, it will grow under artificial light. Normal room temperature is usually fine for this plant. It will thrive in temperatures between 60 and 75° F, though it does not tolerate too much heat, so be careful if temperatures go much higher than this. If you live in a hot climate, then try to keep the temperature inside your home relatively cool; otherwise, the plant will become weak. 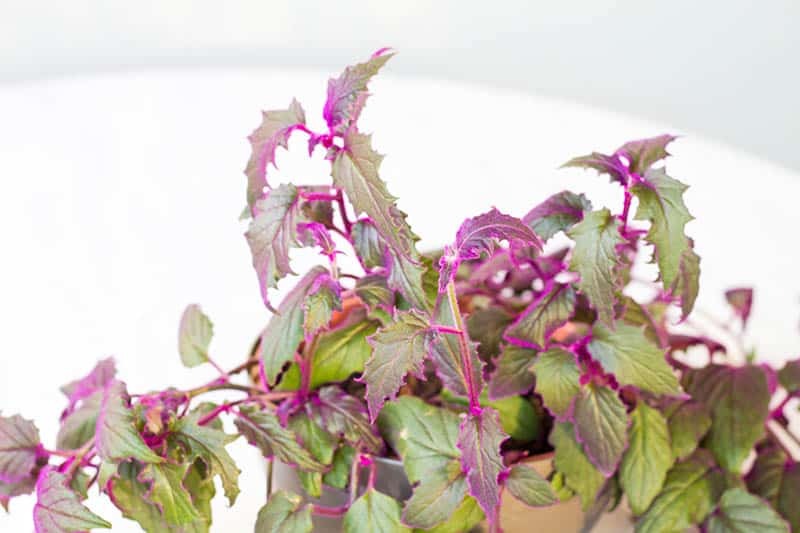 Although the Purple Velvet plant does prefer to be kept on the cooler side, care should be taken to make sure temperatures do not drop too far below 60° F.
This is a hungry plant that likes its fertilizer. Use a standard houseplant fertilizer mixed to half of the recommended strength. You can feed this to your Purple Velvet plant every one to two weeks during spring and summer, and reduce this down to once every month or two during fall and winter. If your plant stops growing completely during this time, you can stop feeding it until spring returns. This plant has a tendency to get tall and leggy if it isn't pruned, so prune it aggressively to encourage growth lower down. Pruning the plant will result in a fuller looking plant, which is bushier. The Purple Velvet plant is typically only kept inside for two to three years, so you likely won't ever have the need to repot it. As the plant ages the purple hairs covering the leaves fade and become less vibrant, eventually turning a dark, dull, and somewhat unattractive shade. It is at this point that the owner will usually dispose of the plant or find a home for it outside. During its short lifespan, the plant may become root-bound and look like it needs to be re-potted on, but, the Purple Velvet plant actually does very well in space limiting conditions, and it usually isn't necessary to repot it. If you do decide to repot the plant, do so with great care to not disturb the roots, as they are very fragile and may not respond well to change. This plant produces vibrant, yellow-orange flowers, usually in winter. They look almost like thistles and resemble the flower of a dandelion. While they are quite striking against the purple background of the plant, many people remove them because they have a very offensive odor. If you don't like the flowers on your Purple Velvet plant, snip them off as soon as they appear to avoid having the bad smell wafting around your home. Fortunately, the plant does not frequently flower, especially not during its first years. Flowers generally appear after two or three years and show that the plant has reached maturity. The plant blooming is taken as a sign that it is past its prime, and ready to end its time as a houseplant. If you wish, you can plant the Purple Velvet plant outside; however, it does have a tendency to spread easily, so think about containment. Propagation is a necessary part of growing this plant if you want to keep it around for a long time. As the plant has a limited lifespan of a couple of years, you will want to propagate it to ensure you have new generations of young and vibrant Purple Velvet plants. When your plant reaches maturity, which it will inform you about by growing flowers, it's a sure sign that you need to propagate if you haven't already. You can perform propagation along with pruning if you don't want your cut stems to go to waste. To propagate, you will need the end of a stem at least several inches long. This plant propagates well in water; simply place the cut end of the stem down into a glass of water, ensure it has consistent heat, and wait for roots to develop over several weeks’ time. You can also propagate this plant in moist soil, following the same directions. You could dip the raw end of the stem in rooting hormone to improve chances of success if you want. Propagate in late spring or summer, when the weather is reliably warm to encourage the cutting to root. Alternatively, heat the plant artificially. Bottom heat always works best for propagating successfully (Royal Horticultural Society). Once the cutting has successfully rooted, you can plant it into a more permanent soil and pot, and continue care as usual. This plant is not toxic to humans or animals, making it an ideal houseplant to have in your home if you have children or pets that are liable to investigate the plant and potentially nibble on it. While the Purple Velvet plant is not poisonous, it is not recommended to ingest any part of it. It may result in a stomach ache, and some people have been found to be allergic to it. This is a low-maintenance plant that does not typically encounter a lot of problems; however, if growing conditions are not ideal, then some issues occur. Pests are also, unfortunately, an oftentimes unpreventable part of growing plants. Leaves that become brown at the tips, around the edges, and eventually all over, are a sign that your plant has been scorched. The two main causes of this are too much direct light and too much or too strong fertilizer. The Purple Velvet plant is a hungry plant and typically thrives on frequent feedings of diluted fertilizer. However, there is a debate about this amongst growers of this plant, with some claiming that fertilizer should be used on a weekly basis throughout the growing season, while others believe it should be fed less often, at a frequency of every two weeks or even monthly during spring and summer. You should be able to deduce from your caring habits what is the cause of your plant's scorch. If you know that it hasn’t experienced any direct light, then the cause of the brown leaves is most likely due to heavy fertilizer use, and you can adjust your feeding schedule accordingly. Equally, if you don’t fertilize the plant very often, then it is more likely the scorch is a result of too much light, and you will need to move the plant to a more suitably lit spot to allow it to recover. The Purple Velvet plant can fall victim to all of the common pests typically associated with houseplants, such as aphids, mealybugs, scale, and whiteflies, though probably the most common pest is the spider mite (Missouri Botanical Garden). Spider mites can go undetected on your plant for quite some time because they are so tiny that it’s hard to see them with the naked eye and also because they hide on the undersides of the leaves. One indicator that your plant has spider mites is if it starts to develop small yellow spots on the foliage. As the infestation develops, the spots will turn brown and could even result in whole leaves turning brown. If your Purple Velvet plant has a spider mite problem, you may also notice some webbing on your plant. As arachnids, spider mites use spider webs to protect themselves and their eggs. If you suspect spider mites are infesting your plant, you can lightly shake the plant while holding a piece of white paper underneath. If spider mites are present, you will notice tiny dark specks falling onto the paper that resembles ground pepper. If an infestation is severe, it will stunt the plant's growth and eventually kill it, so it needs to be treated sooner rather than later. As soon as you become aware of spider mites on your plant, the first line of defense is to take the plant outside and spray it with a strong force of water from a hose. The high pressure of the water should be enough to wash off most, if not all, of the mites. Repeat this twice a day for up to a week, and in most cases, the infestation will have been removed. Another method is to spray the plant with neem oil or another insecticidal oil. Alternatively, there are some natural predators of spider mites, which will take care of the infestation for you if you can release them in the plant's habitat. These include ladybirds, predatory thrips, and the very appropriately named spider mite destroyers. Pesticides should be avoided for several reasons. First, spider mites are resistant to pesticides, and second, pesticides will reduce the populations of beneficial bugs on or around your plant, only serving to make the spider mite problem even direr. The thin and fragile roots of the Purple Velvet plant make it especially susceptible to root rot. Root rot often goes undetected until the condition is severe and irreparable due to the problems happening beneath the soil’s surface. Signs to look out for that your plant is suffering from root rot are brown patches on the leaves and curled or distorted foliage. Root rot will turn the bottom of the roots and the root crown slimy and dark in color. This condition is solely the result of overwatering, and therefore you should take care to ensure the soil around this plant is moist but never wet. 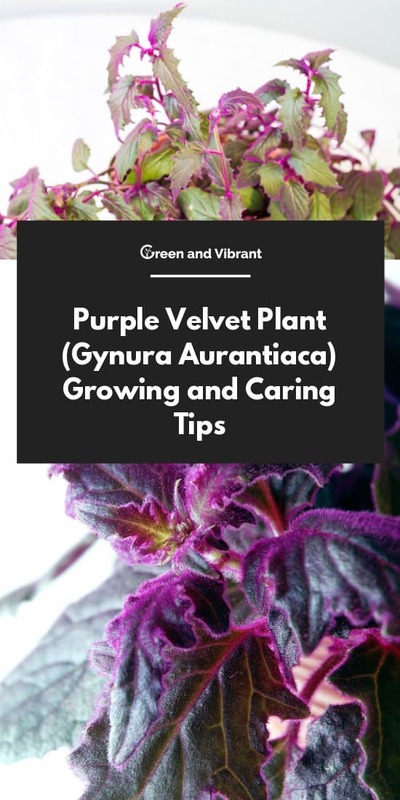 If your Purple Velvet plant does suffer from root rot, you can try to remedy the problem by removing the plant from its pot, brushing off as much of the soil as possible, and cleaning the roots off by placing them under running water. Do not repot the plant for a few days, instead of letting the roots air dry. If there are some remaining roots that are not badly affected, you can remove the rotten roots and focus on re-growing the plant from the healthier roots. Repot the plant in new, dry soil and care for the plant going forward by paying careful attention to how much you water it. If you have any other questions about Purple Velvet plants, please leave a message in the comments, and we’ll be happy to answer. We also invite you to share this article with your friends who may have or be looking into getting a Purple Velvet.